Our beginners’ course is structured around you – the customer. We will make the lessons as interactive as possible by having clearly defined objectives for each lesson. The structure of the course will be based on using coaching methods to bring out the best of you and your driving. The relaxed atmosphere created will allow you to achieve a quicker learning process. Enjoying the lesson is important, on every lesson the instructor will encourage your questions to clarify any misunderstandings that you may have. We call this “client centred learning” – helping you to realise your own objectives. All instructors will do their utmost to arrange lessons in a flexible way, working in with your work/college schedule. You can choose to take 1 hour or 2 hour lessons – but, if you take up the 2 hour option, you will be getting the best value for money and reducing the learning period achieving a quicker test pass. FREE hazard perception & theory test training included. 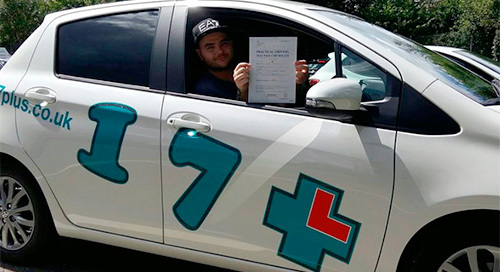 Weekly lessons greatly increase the chance of a FIRST TIME PASS. Our driving lessons are on a ONE-TO-ONE BASIS. No need to pay in advance to get the discount – simply pay-as-you-go! *Applies to complete beginners with no driving experience. Get in touch to make your first booking! Read some of the comments from our passed leaners. Thank you to Kenny and 17 Plus for helping me to pass my test first time! I always enjoyed my lessons and the learning process – the resources provided were very helpful and Kenny gave me such confidence! Thank you, again!! I would highly recommend Vladimir (17 Plus Norwich) as a driving instructor. He is very good at what he does, the way he explains how to do things is easy to understand and his knowledge of driving is exceptional. Thanks Vladimir! I highly recommend 17 Plus Driving Tuition. I had the worst anxiety going and Malcolm helped me achieve what I thought was the impossible! He made driving lessons feel comfortable. After 4½ yrs of trying to pass my test – I’d tried 3 different schools before 17 Plus, this was by far the best one – I soon passed. So, if you want to learn, go drive with 17 Plus, it will be the best money you have ever spent! 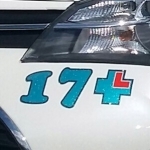 Thank you Stuart and 17 Plus for all your support and getting me through my driving test. I was a very nervous beginner but Stuart made me feel calm, at ease and confident about my driving and the progress I was making. Disappointingly, my Dad booked me a 5 day intensive course – it was awful and knocked my confidence! So I contacted Stuart and he welcomed me back and fitted me in straight away. What an absolute credit to the 17 Plus Team. I went on to pass – thank you!